Stems erect, 1 to 2 feet high, from a perennial root, pubescent or smooth. Leaves ternately divided, the divisions pinnate with the lower ultimate leaflets sometimes again compound; leaflets ovate or the terminal ones obovate, toothed or more or less cleft or incised with pointed or rounded teeth. Flowers small in a dense terminal, ovoid raceme; sepals three to five, petaloid and fugacious. Petals four to ten, spatulate, shorter than the numerous white stamens; pedicels slender, one-half to two-thirds of an inch long. 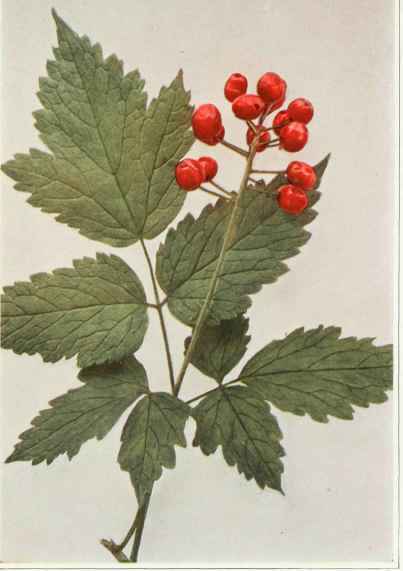 Fruit consisting of a raceme of bright-red, oval or ellipsoid berries, each berry about one-half of an inch long. In woods, thickets and shaded banks, Nova Scotia to New Jersey and Pennsylvania, west to South Dakota and Nebraska. Flowering from April to early June. 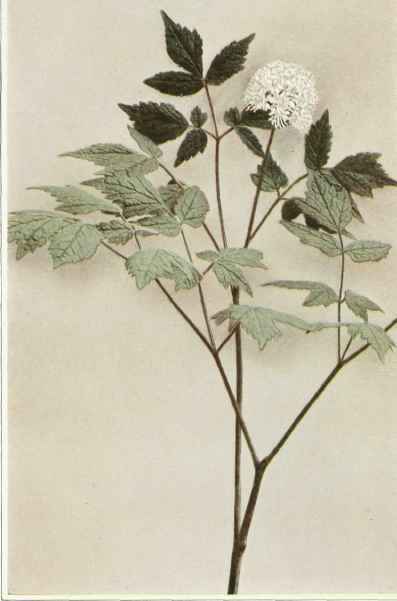 A variety with red berries on slender pedicles (Actaea neglecta Gillman) is occasionally found.